Camp Blue Bay is great! Each day starts with a counselor waking you up and telling you what you’ll need for the day. Don’t worry, they remind me to put on sunscreen and brush my teeth. Before breakfast, there is a flag ceremony. Then we eat! We can sit wherever we want, so I like to sit with my friends (I’ve made a ton... some are Girl Scouts, some aren't, but that's okay because you don't have to be a Girl Scout to go to Girl Scout Camp), my sister (she’s in a different unit), and my favorite swimming counselor. My favorite breakfast is muffin Monday. I also have 2 bowls of cereal, they have lots of kinds to choose from. After breakfast, we met back up with our unit so that we could head for boating. We sang songs the whole way there. We put on our PFDs to get ready. I’m taking canoeing lessons this week. Today, I learned how to paddle forward and backwards and turn the canoe around. My friends and I had a great time trying to race the other canoes across the creek. After canoeing, we went to the sports field for initiatives. This is one of my favorite activities. We play lots of games where we all have to work together and there’s no winner. It’s so much more fun than gym class in school! We play human knot, where everyone sticks their hands into the circle and grabs other people’s hands. Then we have to figure out how to “untie the knot” without dropping hands. Next, it was off to lunch! Tacos, yum! After lunch, we had brownies for dessert, and the whole dining hall sings silly songs while we ate them. After lunch was rest hour, we played board games in our unit, hung out with our friends, and had time to write home and tell you all about the fun we’re having! Next is campcraft. 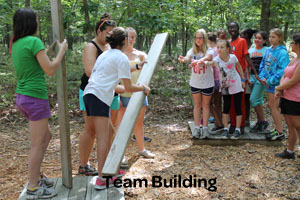 In campcraft, we learn camping skills, like pitching tents and building fires. This week, we’re learning how to use compasses to find our way. Today, our counselor gives us coordinates to follow that lead us down a trail. I can’t wait to show you what I’ve learned! Afterwards, it’s swimming! We get lessons first, and our teacher is awesome. I’m learning how to do sidestroke. We play a few water games, work on our strokes, and then get time to play Marco Polo before it’s time to get out. Then, we hit the showers. The counselors help us wash and do our hair. The whole unit heads off to dinner wearing pigtails, even the counselors! After taking the flag down, we eat! The salad bar is my favorite part of dinner. After dinner, there are Interest Groups. We can choose any activity we want. Some of my friends are going to water aerobics, but I’m excited about tie-dye. I can’t wait to show you the t-shirt I made! It’s been a full day, so, we’re heading back to the unit to open our mail, read our books, and head for bed! I’ll write more tomorrow! Thanks for sending me to sleepaway camp! We all know that by selling Girl Scout Cookies we earn rewards like Cookie Credits, Journey Books and Trips to New York City, but did you know that when we sell Girl Scout Cookies, we are Cookie Professionals who are learning #5skills! We are developing skills ranging from goal setting and decision making to money management, people skills, and business ethics. Before you start selling your Girl Scout Cookies, you need to decide what you would like to do with the money you earn and then figure out how many boxes of cookies you need to sell in order to be able to do the activity that you decided on… This involves both Goal Setting and Decision Making. When you are going door-to-door, you have to introduce yourself to the potential buyer, describe what it is you are selling and ask if they would like to purchase. Then that potential buyer could ask you questions that you would have to answer… This is communication, which is an important part of People Skills. When your Troop is hosting a Cookie Booth Sale, you will need to calculate the total price a customer will have to pay based on the number of items sold and the amount of change you will need to give the customer. For example, if a customer decides to buy 4 boxes of Girl Scout Cookies at $4.00 a box, you should be able to tell the customer that they owe $16.00. When that same customer gives you $20.00, you should know that you need to return $4.00 in change… This is part of Money Management. Now, if you are not the only Girl Scout selling Girl Scout Cookies in your house or on your block, you need to make some decisions regarding how you both are going to sell those cookies—are your going to sell all the cookies yourself? Or are you going to work together and split the cookie sales down the middle 50/50? These are important decisions to make! You need to make sure you do what is right and consider this Golden Rule: You should treat others, as you would want others to treat you… This is Business Ethics! So next time you are at your Cookie Booth Sale, think about those #5Skills and ways you can learn way more than just 5. 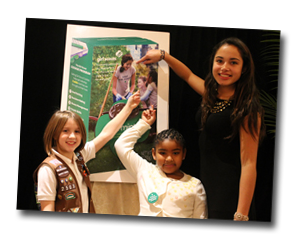 2012 was a happening year for the Girl Scouts of Nassau County and the Girl Scouts of the USA! There were so many fun things ... and there were challenges. One of the most heralded days of the year was March 12th, when we celebrated our 100th Anniversary of Girl Scouting in the USA. In honor of the 100 years, Girl Scouts of Nassau County started the day pre-dawn so that we could hold a Sunrise Ceremony. We continued the day with an Open House, welcoming all Girl Scouts and their families to the opening of a Time Capsule from the 85th Anniversary! It was exciting to turn 100! There were so many exhilarating ways to celebrate throughout the 100th year ... Girl Scouts of Nassau County the turned the Nassau County Dome Lighting Green, started Troop Nassau Violets, welcomed a few baby girls who were born on March 12th into Troop 2012, and dedicated the Juliette Gordon Low Park. 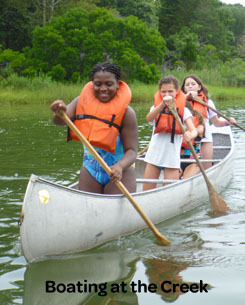 Girl Scouts from Nassau County also participated in larger events around the country like Rock the Mall in Washington, DC; the Camporee in Savannah, Georgia; the B.I.G. Event at Liberty Park in New Jersey; Rock the Falls in Niagara Falls, NY; and the Girls World Forum in Chicago, Illinois. 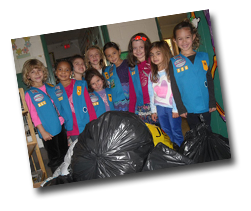 We sold lots of Girl Scout Cookies in 2012! 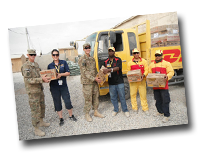 With a focus on the 5 Skills that the girls learn as part of the Girl Scout Cookie Program, with help from our friends at DHL Global, GSNC sent over 50,000 boxes of Girl Scout Cookies to our military personnel around the world as part of Operation Cookie -- the DHL send-off day was lots of fun! Spring saw our girls running towards and conquering the many challenges we gave them. At the Girls Go the Distance Walkathon and Activity Fair at Old Bethpage Village Restoration, Girl Scouts of all ages and their families walked a little over 2 miles even with the wet weather. At the City Scrambler, girls raced their way through parts of New York City on the hunt for clues to lead them to their next destination. The Lego Chicks went to a national invitational tournament as the result of winning the Regional’s in FIRST Lego League. 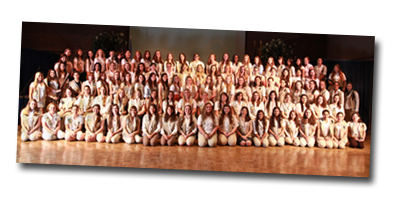 In June, 121 Senior and Ambassador Girl Scouts earned their Girl Scout Gold Award in Nassau County, while hundreds of other girls achieved the Girl Scout Bronze Award and Girl Scout Silver Award. The summer season brought on the tie-dying, fishing, gardening, sailing and the ropes course, with hundreds of girls taking advantage of our summer programming. 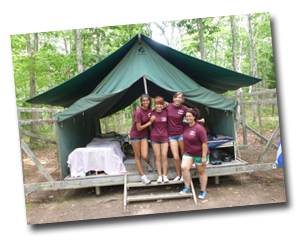 Girls who participated in the GSNC Summer Fun Day Camp at Wantagh Park had the opportunity to spend their day doing fun activities with their friends, while still having the comfort of sleeping in their own homes. 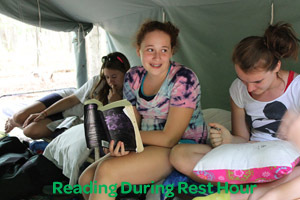 Campers who attended GSNC’s Camp Blue Bay Sleepaway Camp were able to sleep under the stars and in tents with a variety of camp program choices. Just as school was back underway, we started our fall registration process and worked with our volunteers to make the Back to Troop Season a success. In early October, the new Girl Scout Cookie Boxes were unveiled and almost every variety of Girl Scout Cookies has Girl Scouts from Nassau County as the faces and activities seen on the new cookie boxes! The first upgrade to the Girl Scout Cookie Boxes in over 15 years, the new boxes tell the real story of the Girl Scout Cookies and how supporting the Girl Scout Cookie Program supports skill building for the girls and action in the community. Towards the end of October, Superstorm Sandy forced Girl Scouts of Nassau County to postpone the 100th Anniversary Gala (this means we get to keep celebrating the 100th Anniversary… at least until our re-scheduled date on March 14). The Gala was the least of our concerns! Some of our girls and their families suffered property damage --some even lost their homes -- and almost everyone in the area went without power many days. But almost as soon as the rain stopped, on the very first day, Girl Scouts reached out to one another to see how they could help. We were truly Sisters Helping Sisters, helping with community relief efforts and creating a GSNC Hurricane Sandy Relief Fund and GSNC Trefoil Relief Cards. Meanwhile, Girl Scouts from across the country wanted to help us, and began to make donations ... Operation Be a Sister, in Indiana, jumped in to provide uniform components and badges, while others sent care packages and Christmas gifts ... As devastating as the damage was from the storm, the outpouring from Girl Scouts and others all around the USA and the world have helped to restore our faith in one another. 2013… Here come the Girl Scouts! Don’t forget to stay in touch with us through our website, "Like" us on Facebook, "Follow" us on Twitter, subscribe to our Program News e-newletter, and do read our print publications, GirlFriends and Possibilities.